Is Germany really a broadly non-religious, secular and modern state as most concur? Or is the church and state pretty much intertwined? 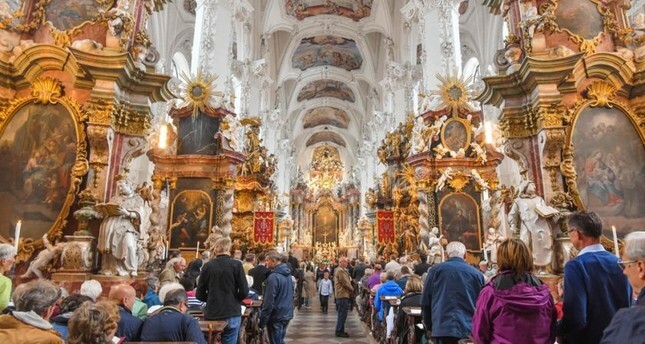 New data has shown that despite a decline in active members practicing Christianity, churches and dioceses in Germany continue to receive billions in funds from obligatory taxes paid by the faithful. Citing a survey by German civil rights organization Humanist Union (HU), Frankfurter Allgemeine Zeitung (FAZ) reported that churches in Germany had received a total of almost 17.9 billion euros ($20.3 billion) in state benefits since 1949. Germans officially registered as Catholics, Protestants or Jews pay a "religious tax" of 8 or 9 percent of their annual tax bill. The so-called "church tax" was introduced in compensation for the nationalization of religious property. The arrangement was made with the 1919 Weimar Constitution and later prescribed into the current constitution after World War II. According to FAZ, these religious taxes, which have been collected as compensation for expropriation since the 19th century, amounted to a whopping $610 million (538 million euros) in 2018, with the Protestant church receiving about $356 million and the Catholic Church $254 million, despite great dips in church attendance. 2.2 million people have reportedly de-registered from the Catholic Church since 2000. This is approximately a 14-million-euro increase compared to the previous year, not counting the subsidies paid to the churches by the 16 German states, and is also the highest total reached in 100 years. The Evangelical Church in Germany (EKD) and the German Bishops' Conference have not yet commented on the figures. According to the EKD, state benefits amount to an average of 2.6 percent of the respective household in state churches. Several other European countries such as Austria, Denmark, Sweden, and Italy, have also imposed church taxes to fund Catholic and Protestant institutions. The measures have been widely criticized for being compulsory for practicing Christians and for blurring the lines between church and state as they are collected by the government itself. Catholics and Protestants are almost equally distributed in Germany, with each at about 24 million, an estimated 57 percent combined of the 82.7 million population. There are also about 4.4 million Muslims and 120,000 Jews in Germany.